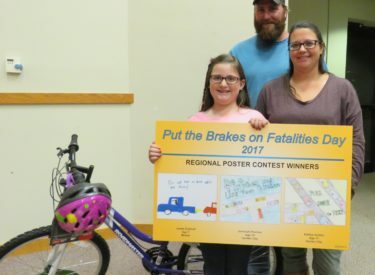 Meade Elementary student Jaylee Eckhoff is the southwest Kansas regional winner in the age 5 – 7 year age group in the 2017 Put the Brakes on Fatalities Day annual poster contest. As a first place winner Jaylee received a bicycle and helmet donated by Safe Kids Kansas at a presentation at Meade Elementary School on Tuesday, October 24. The prizes were presented by the Kansas Department of Transportation. Each year approximately 35,000 people die in transportation-related crashes in the United States. In 2016, 429 people lost their lives in traffic crashes in Kansas. In an effort to focus on safety and reduce the number of traffic fatalities, numerous transportation agencies work together on Put the Brakes on Fatalities Day activities throughout the state. These activities include daily safety blog posts from people across Kansas sharing stories of why traffic safety is important, poster and video contests for Kansas kids and a statewide news conference at the Capitol. A total of 1,048 kids ages 5 to 13 took the time to think about safety and participated in the contest. Put the Brakes on Fatalities Day is a nationwide effort to increase roadway safety and reduce all traffic fatalities. The official day is Oct. 10, but it is a safety campaign that is highlighted all year long. For more information, go to www.ksdot.org and click on the Put the Brakes on Fatalities Day information.